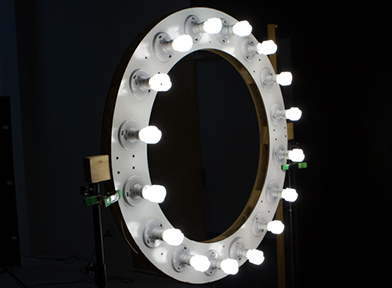 This is our giant ringlight. It is 4 foot in diameter and has 16 evenly spaced CF bulbs. It has a color temperature of about 2500 K. It was designed and built by our photographer/electrician friend Tom S. The ringlight resides at Tom's house but he brings it to the workshops whenever he is able to.